Nigeria is one African country that has started stepping up tax collection. The expected slowdown in many African countries, particularly the big oil exporters, may be an opportunity to diversify sources of revenue and support private investment, according to this year’s Foresight Africa report from Brookings Institution. Countries can instead increase their focus on building infrastructure and expanding local tax bases to help develop local economies. That will help them move beyond dependence on revenue from exploiting natural resources. As Brookings points out, with foreign aid budgets staying flat in most major donor countries, the role of private investment will be increasingly important. Fostering an economic environment that engenders trust, transparency and mitigates uncertainty will encourage that investment, whether international or local. The US attitude toward Africa may be particularly important this year. A report in the New York Times provides some long-sought insight into the early thoughts of president-elect Trump’s team. It’s based on a four-page list of questions doing the rounds with Africa experts in the State Department and Pentagon. One its key themes is whether some of the United States’ aid and security programs still make sense in the continent. Long-time US-Africa watchers feel the framing of the questions indicates a significant change of tone and some believe it could spell bad news for long-term US aid projects to Africa. 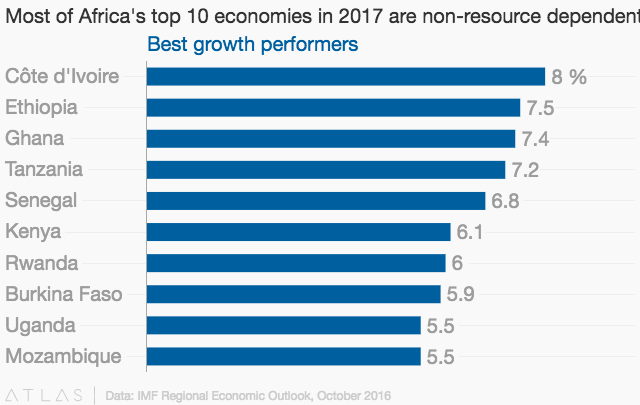 If African governments and business leaders are smart and focused they will be able to leverage this concern to their advantage, as we’ve said before about China and Africa. African countries can only do that by ensuring the fiscal and regulatory environment is ready for the possibility in the first place. This isn’t really about Trump or about China, it’s about getting your house in order to take advantage when opportunity comes knocking. This should be the norm, not the exception.